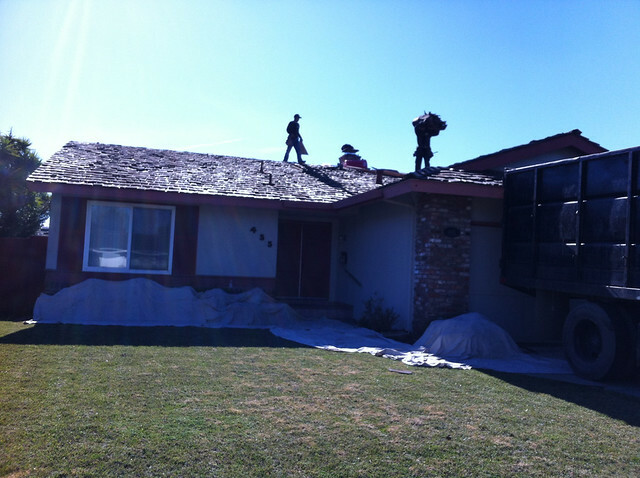 Williams Roofing tearing off our old roof. 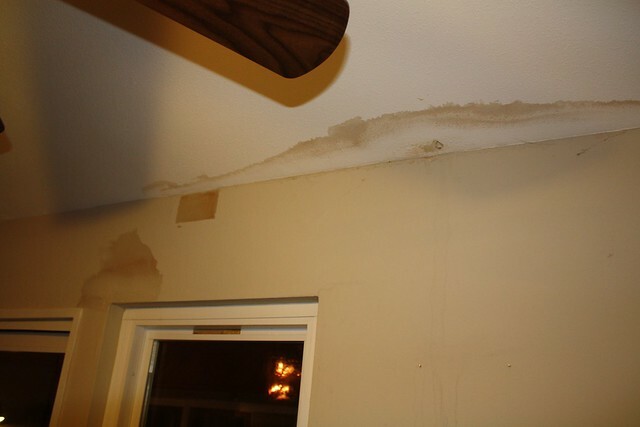 A few storms ago we noticed a leak forming where Jeff’s computer desk is in the living room. We know its because of the connection from the sunroom addition and the living room. Well after a particularly bad storm this season, I come home from work at night and notice a musty smell. First I thought it was the litter box but that wasn’t it. 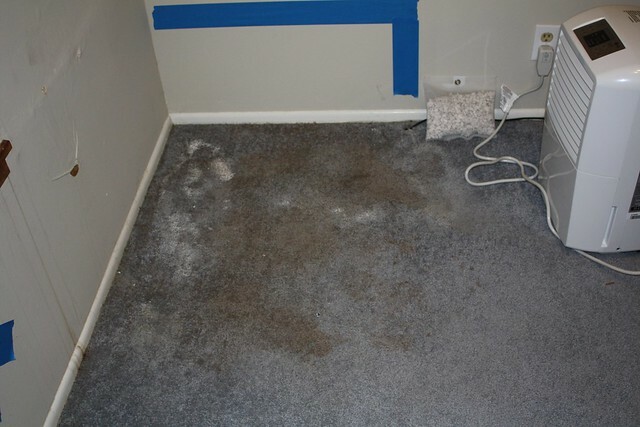 I followed my nose to under Jeff’s desk and the carpet was very damp. I suspected it was there at least a few days and sure enough mold was growing everywhere! We tried to get rid of it but it still stunk and was mildew stained. Jeff was a trooper through all of this — talking to so many different vendors to try to get the best value/price/expertise. After a lot of coordination and back and forth we finally lined up the water damage people to strip the drywall and carpet and remove the moisture. 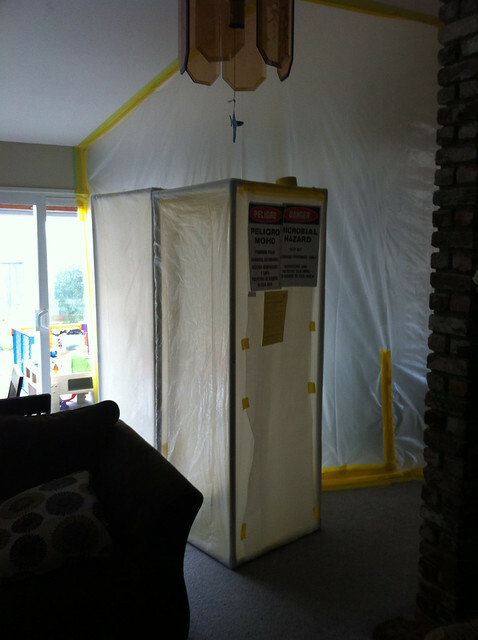 OH and can’t forget about the asbestos in the glue they used for the seams of the wall. Got rid of that too. 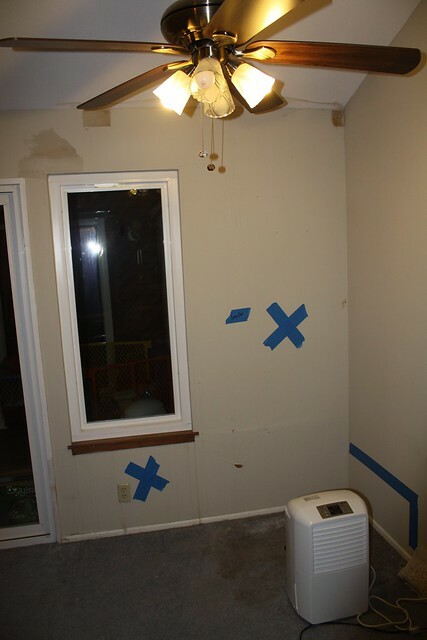 The blue tape is where the ServPro assessor said there was water damage. We picked Williams roofing for our new roof after getting 3 other bids. They seemed the most experienced and price was competitive. They did the work when I was home sick with Vinny. It was so loud and dusty! We got everything done just in time for my parents to visit! So glad that’s over with..! 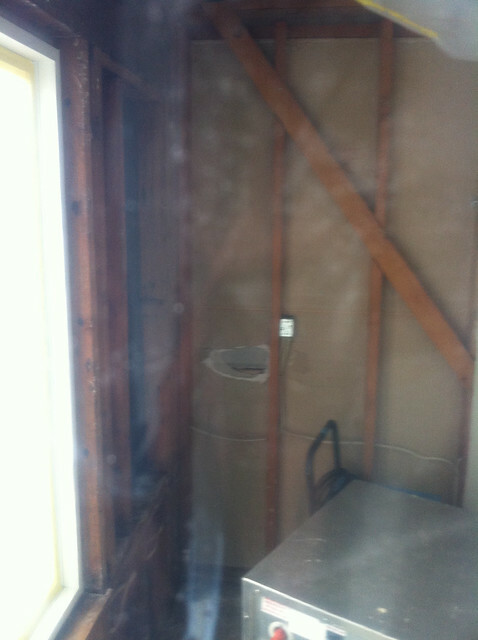 The insurance paid for the internal repairs because we had a bad storm so it worked out for us on some level. Two unfortunate side effects where that my laptop burned out when we had a power surge while the professional dehumidifier was on during the drying process. Cost $400 to fix. And also our tankless water heater’s air filter got clogged with debris from the roof repair and we had to pay $135 to clean it. In the midst if this I broke Jeff’s computer (on accident) and he had to get the whole thing reformatted and lost all his files. So much bad luck… So much money spent!!! 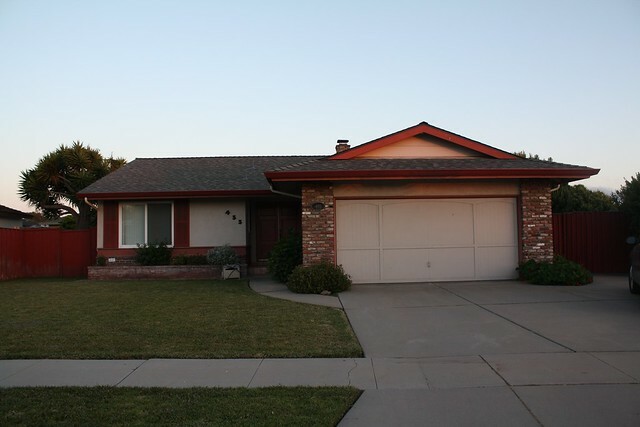 But at least it’s fixed and we have a nice new roof with no worries for another 30 years at least! Here is the finished roof! It is a bit more gray then we wanted, but oh well, said and done. Doesn’t leak and a LOT better looking than that wood shake!